An easy book to read about a difficult subject. An unusual memoir that's not about blame. EDITORIAL REVIEW: The love that binds a family—and the hidden fissures that fracture it—are revealed in this haunting memoir.In some ways Alexander’s Irish Catholic family is a picture of strength and longevity; her parents never divorced and raised three daughters and a son without glaring dysfunctions. But there were sharp heartaches during her childhood in Corpus Christi, Texas, including a stillbirth. And there were more muted conflicts, the author writes, between “[m]y mother, ill-equipped to speak her mind, [and] my father, ill-equipped to read it”; between the author and her siblings; and between the family as a whole and her domineering father, whose return from work each day was “unceremonious, unnoticed and as far as he was concerned, unwelcome.” Alexander (Choices 86,400 a Day, 2011) traces these tensions back to her parents’ and grandparents’ hardscrabble childhoods and to their loss of loved ones and experience of disruption, and forward to the fraying ties between her parents and their adult children, especially the son who incurred her father’s anger for marrying outside the church. Eventually, in her parents’ old age, as the author pushes their wheelchairs and tends to their frailties, wounds and estrangement partially heal amid a renewed sense of all they share. Alexander lays out this history obliquely in a series of fleeting, fragmentary, poetic vignettes, often no more than a solitary paragraph or stanza, that merge into a pointillist tapestry. Her prose is quiet, but it has a luminous immediacy—“One morning I saw my mother spellbound by sunlit patterns on the kitchen counter, the ladder slats of the window blinds tilted just right”—that brings the plainest domestic scene to life; her voice is restrained, yet she uses it to convey intense emotions. As much as this book is about disappointment, grief and regret, it’s also about the affection and longing that make those feelings so painful.An album of finely wrought, moving impressions of relationships and buried feelings. --KIRKUS REVIEWS "The World's Toughest Book Critics"
No two families are identical but you will find something familiar in this powerful book. It breaks new ground for memoirs. Spellbinding prose. The innocence and joy of childhood and the raw emotions of growing into the starkness of adulthood stirred some long forgotten feelings. It was a book hard to put down. This book grabbed me. I laughed and cried my way to the end. A poignant drama. The Chinaberry Tree is an exceptional and stirring memoir. It’s as if Lauren Alexander spent much of her life taking snapshots of her family at various times, some incidental and some significant, and translated them into very artful poetic prose vignettes. Memoirs often expose how dreadful life has been for the author. The Chinaberry Tree goes much deeper, illustrating the unguarded moments in life that shape one’s future as well. Although the book is nonfiction, the words are as craftily chosen as in any outstanding novel. The stories, so beautifully drawn and sequenced, pull the reader into the emotional evolution of the author’s personal joy and pathos within her family unlike any other memoir that I have read.I hope that this paves the way to an entirely new form of memoir that truly raises the literary level of the genre. 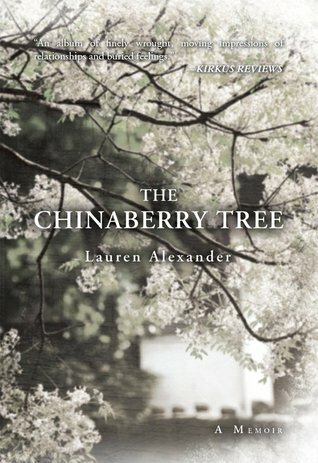 The memories and experiences Lauren describes in The Chinaberry Tree may differ from other's in the details but I believe the feelings and emotions reading the book evokes are universal. The words she chose to describe her memories are lovely, lyrical - and revealing. Highly recommended! Not quite poetry but not quite prose.